When did the Long Nineteenth Century become the Twentieth, and the Age of Empire one of Extremes? Dal Lago, Healy, and Barry’s book traces key anti-imperial struggles, around which much spun, to 1916. And justifiably so. With the Irish Easter Rising as fulcrum for national self-determination and anti-imperial struggle this is a fitting moment for the end of the Age of Empire. The Easter Rising’s proximity to the metropolitan hub and that year’s First World War (WWI) nadir, the case is strongly made across 15 contributions. If the Easter Rising is the hub, the spokes of conflict and cooperation connect contemporaneous actors, movements, and emerging (inter-)national institutions the world over. 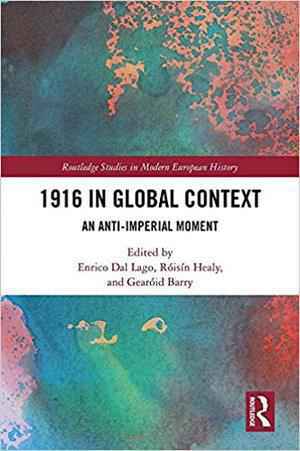 In this, Dal Lago, Healy, and Barry’s 1916 in Global Context is in the finest mould of global history. Other approaches compete for this era’s global moment: most of all the 1919 Wilsonian and 1917 Bolshevik. Erez Manela’s 2009 Wilsonian Moment, of similar scope and breadth, is comparatively top-down and internationalist in tracing the ideological effects of Wilson’s platform and person rather than recognising the global agency of historical actors at all levels. In this, the present volume complements that diplomatic history but outclasses it for holistic globality. In contrast, 1916 in Global Context presents serious competition to the Bolshevik Revolution’s position as the event ne plus ultra of forceful activism in the early Twentieth Century. This volume does not dislodge 1917. It notes Lenin’s admission that the Easter Rising, if premature, was connected to the Bolshevik in broader anti-imperial dynamics (p. 4). In showing how Irish insubordination to the British Empire close to home had global connections and reverberations it suggests that ‘the Easter Rising of 1916 was followed by a series of anti-imperial revolts, which culminated in the Russian Revolution of October 1917[…]’ (ibid.). This volume convincingly roots the anti-imperial moment in 1916. The ‘temporal clustering’ of 1916 as laid out by the writers is remarkable and spans the globe. Chapters ‘highlight the contemporaneity of multiple anti-imperial occurrences and their links with the Irish rebellion’ (p. 4) from Europe, to India, Canada, Turkestan, South Africa and Australia, in four sections. The first section’s two chapters frame the work by profiling the Easter Rising’s anti-imperial, revolutionary warfare. The editors situate the book amidst cognate research effectively, especially Keith Jeffery’s invitational staking out of 1916  as crucial to the imperial destabilisation of WWI. The seriousness of the Rising arises from the combined role of modern communication technology and tactics with democratic and elite politicking for anti-imperial self-determination and invigorated nationalism. Hoyt’s chapter emphasises the rebellion’s ‘very Irish’ nature to show how its distinct, irregular character ramified its global import, along with the (counter-)insurgency’s dilemmas. The learning and revolutionary creativity of secret organisations heralded a new era with novel guerrilla methods of intelligence, organisational security and service provision to yield ‘a model of national resistance[…] viable even today’ (p. 27). In section two, ‘The Atlantic World’, authors localise anti-imperial struggle via the Easter Rising’s coverage in Quebec’s press, the Great Migration in the United States, diverse confluences of nationalists in New York, and the 1922 Rand Rebellion’s Irish connections. For example, Courtois assesses coverage of the Irish struggle in Canada’s press, sketching it away from Irish diasporic ‘lack of response’ to French Canadian sympathy and resolve to ‘normalise’ French Canada’s own resistance to the British Empire. His use of sources to exhibit significant diversity of religious, linguistic and political affiliation is dexterous. Brundage depicts the broader anti-imperial global context of prominent activists and organisations connecting and agitating across borders for self-determination in the hotbed of New York. Happenings in North Africa, Asia and the Pacific open with Provence’s accessible overview in section three of how imperial anxieties and powerplays (‘the harsh realities of 1916’, p. 100) devoured national self-determination in the Middle East in contrast to other regions. He attributes frantic—but successful—reassertion of imperial power to British calamities of 1916, seeing proxies (including the abortive Arab Revolt) as poor substitutes of genuine national self-determination and recognising that propaganda and resources ‘provoked a range of desperate responses’ (p. 102). Sadly, Provence does this with blunt state-centrism and few sources. O’Halloran’s ‘Tempest in a British Teapot’ is incisive on rivalries between the Arab Bureau, Whitehall, and India Office. It details interdepartmental squabbling over the salience of pan-Islamism as against nationalism to show how British policy saw subject orientals through communal lenses of almost mystical fogginess. Ross’ ‘Dublin to Turgai’ is a novel account of ‘small nations’ discourse in Russian-Muslim reportage. She depicts how Turkic press, publishers, readerships, and activists took different lessons for anti-imperial revolt in the Easter Rising, according to changing local conditions. Segesser’s short contribution deftly complicates Irish-Australian politics. It refreshingly holds climatic conditions and imperial politicking in global wheat markets to account for the 1916 Conscription Referendum loss as much as diasporic concerns arising from complex loyalties to Empire and local Australian communal identities. In beginning section four’s treatment of continental Europe, Bell provides an ‘ideological audit’ (p. 161) of British labour’s complex relation to the Irish Question and fittingly highlights female activists. Newby contrasts how strategies to win self-government differed, but Newby’s best insight lies in the contradistinction between ‘[t]rue anti-imperial sentiment [that is] opposition to the principle of imperialism rather than a pragmatic nationalist reaction against the nation’s own imperial power’ (p. 202). If Newby shows how agency exercised by Irish and Finnish activists was ‘often pragmatic and opportunistic’ (ibid.) towards imperial powers, Healy’s comparison of Poland’s and Ireland’s independence bids contrasts geopolitics: Ireland was ‘isolated on the western periphery of Europe’ (p. 213) and Poland occupied an ‘imperial shatterzone’ (p. 212). Changing meanings of loyalty, treason, martyrdom, and the conflation of nationality and citizenship are brought out by Wilcox’s concrete and symbolic examples of ‘Trentinis’ caught between the Dual Monarchy and assertive new Italian nation. In this it overtures the crucial transition from Empire to Nation that undergirds the whole book. 1916 in Global Context manages to be both cohesive and comprehensive. It adeptly weaves conflict and cooperation between strands of propaganda, high politics, and violence around the world. Authors forensically show the extent and limit of transnational connections, demonstrating mostly excellent source work and analysis across a gamut of relevant and crisscrossing topics. It would benefit from more detailed treatment of the conceptual frame of globality across all chapters, one example being Newby’s insight that genuine anti-imperialism as principle differs from opportunistic nationalism; how that distinction may play out across other cases remains in question. The book as a whole is nicely presented with few typos or errors (exceptions: pp. 39, 66, 97, 142, 117, 120), Hobsbawm is twice ‘Hobsbawn’ (pp. 168, 171) and quotation marks in chapter titles are inconsistent (p. 146). The book avoids grandiose claims of ideological cross-fertilization with historical nous; it localises and globalises to judicious extent and effect. That the optimism of the Wilsonian Moment and the force of the Bolshevik Revolution are attractive as international junctures is undeniable. 1916 is their global, grassroots counterpart. For global scope and substantiated importance of transitions to extremes, empire to nation, 1916 in Global Context provides a benchmark both as book and as a most significant year. Erez Manela, The Wilsonian Moment: Self-Determination and the International Origins of Anticolonial Nationalism, Oxford 2009. Keith Jeffery, 1916: A Global History, London 2016. William Jenkins: Rezension zu: Dal Lago, Enrico; Healy, Róisín; Barry, Gearóid (Hrsg. ): 1916 in Global Context. An Anti-Imperial Moment. Abingdon 2018 , in: Connections. A Journal for Historians and Area Specialists, 21.12.2018, <www.connections.clio-online.net/publicationreview/id/rezbuecher-29148>.